IMPORTANT NOTE: Two actions are required in order to enable domain defined grading periods. Teachers must configure their courses to use the domain grading periods. See “How do I align existing course to the new domain terms and grading periods?“ for more information. Once grading periods are defined in the domain, it is important that EVERY course be updated. Unaligned courses will not display the current course grade on the course cards or in the School Browser. This action is only required if domain defined grading periods are enabled in the middle of a term. New courses created after the grading periods will be required to set the school year and grading periods when they are created. Echo allows significant flexibility in defining the School Year and Terms. Below are some examples of several configurations. *Note: weighting is set at the course level. Special Note For Weighted Year-Long Courses For year-long courses that want to use weighting, users must choose to either separate semesters into separate Echo courses -or- weight the currently unused grading periods "0". For example, during semester one, first quarter, second quarter and final exam might be weighted as 40%, 40%, 20% respectively, while the other three grading periods would be set to 0% so that they are not included in the semester grade. At the end of the semester, teachers would need to manually change the weighting for the second semester so that the first three grading periods are weighted as 0% and the last three are weighted as desired. BEFORE CONFIGURING TERMS AND GRADING PERIODS ... we recommend that you work with the staff to confirm the best configuration for your context. It's important that they understand the available options and the consequences of each. If you have any questions, please reach out to Echo Support for clarification. To access the domain settings panel, click the vertical menu then select Domain Settings from the list. Provide a Title for the term. For example "2018-2019", or for schools that don't use year-long courses, "Fall 2018". Provide a Start Date and End Date for the term. Remember that although course visibility for students and teachers is controlled by their enrollment start and end dates, these dates will be used as default values when the enrollment records are created. Add Grading Periods that best suite your school needs. 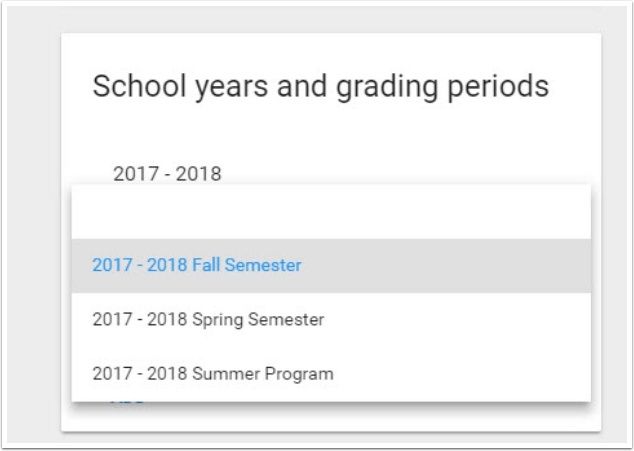 In this example, the school has chosen to use separate terms for each semester and three grading periods for each term. This allows teaches to easily configure their course for a district mandated weighting configuration (40% First Quarter, 40% Second Quarter, 20% Final Exam). Note: the grading period weighting is defined at the course level, not in the domain. 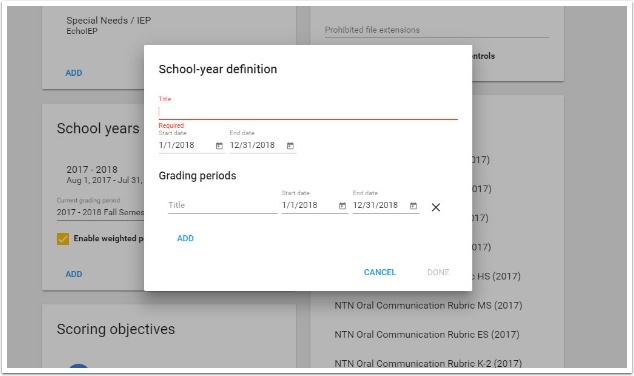 Once Terms and Grading Periods have been configured, Echo Admins must select the current Grading Period for the domain at the beginning of each new Grade Period. Navigate to School Years and Grading Periods from Course Options tab. Open the Current Grading Period dropdown and select the desired period. Note: All of the courses in your domain will use this setting as the default. Ensure that this change happens at the beginning of a new semester or grade period. The final configuration is the grade display option. 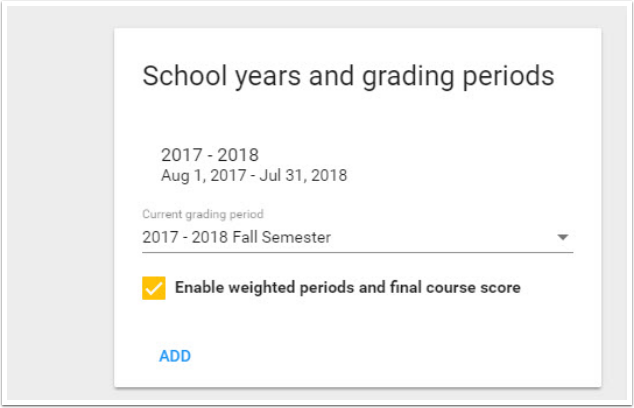 Once Grading Periods have been configured in the domain, Echo Admins can indicate whether the courses are to Show course score in addition to period score. The default is that this option is not selected. This means that students will only see the current grading period's score in the gradebook and their course cards. Use this setting when not using weighted categories. 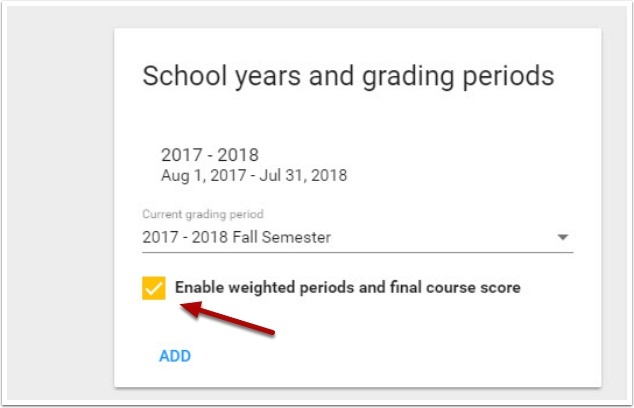 If weighted grading periods are to be used to calculate a final course score, the "Show course score in addition to period score" option must be enabled. 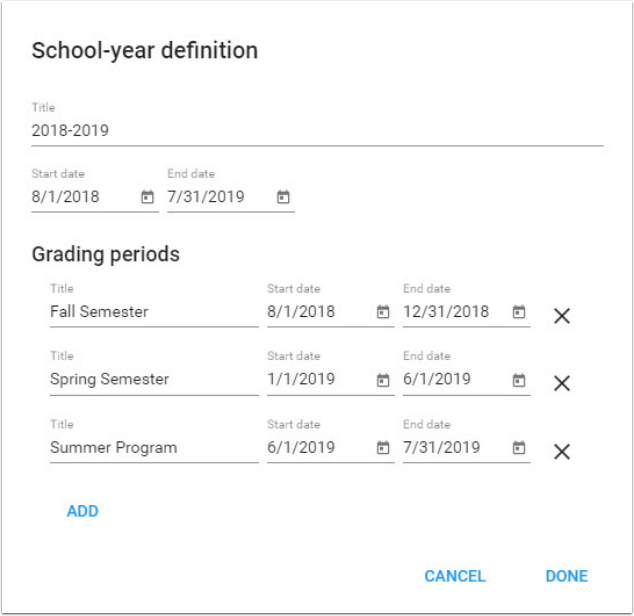 Once enabled, the teachers can set the grading period weighting in their course settings and both the current grading period and the final weighted course score will be displayed throughout the app. Domain can be optionally configured to display both the current grading period's score and the final weighted course score. Click Save after all configurations have been completed. 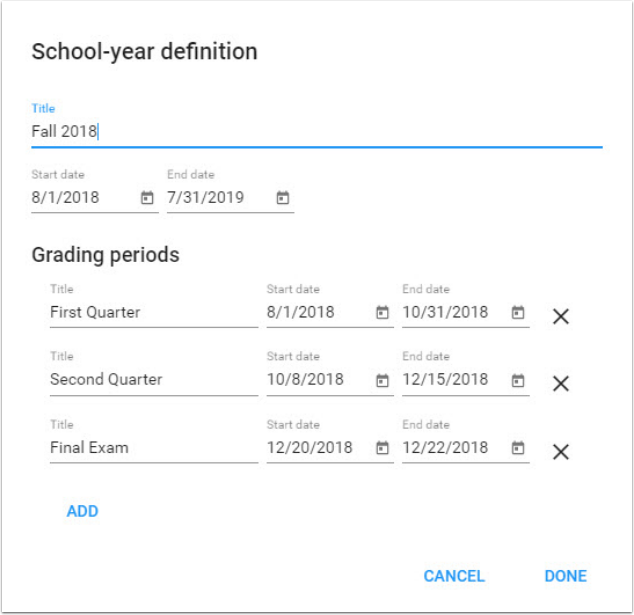 IMPORTANT NOTE: Before teachers can access the “Grading Periods” panel in their course settings, the “Grading Periods” feature must be enabled for them. See “How do I manage the advanced feature controls?” for more information. For information on configuring course grading periods, see “How do I enable grading periods in my course?"